A talking watch. An overcoat for two. A pair of pants for poodles. 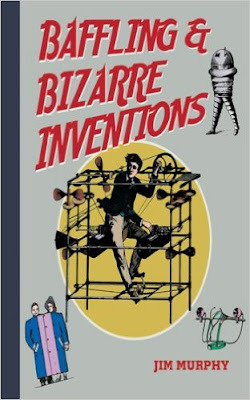 In his companion to Weird & Wacky Inventions, Jim Murphy shows kids some additional baffling and utterly silly inventions in the form of a guessing game that is both challenging and fun. What is a finger-supporting device used for? Can you really buy that talking watch? What on earth is a beard grinder? Whether it’s a device for shaping the upper lip or a life preserver for horses, this parade of unusual inventions is a real treat for trivia lovers and any curious kid with an interest in science and inventions. Ages: 9–12. Excellent family night read. We all enjoyed learning about some very bizarre inventions. I recommend this for every family that enjoys reading together and having lots of laughs.